When Georgia Bulldogs running back Nick Chubb tore three major ligaments in his left knee, he didn’t stop doing what he loved. In fact, his non-traditional rehabilitation treatments might have helped him get back on the field within less than a year. Chubb trained with brothers Sean & Cole Borders, of Borders Black Belt Academy, to regain strength and prepare his knee for the types of hits that he would take as part of the SEC. Mr. Sean Borders explains how martial arts training with Chubb helped get the player on the road to recovery, and how it changed his life and his business. Georgia Football | Beneath The Helmet | Nick Chubb: The Recovery from Chris Gilmore on Vimeo. How did you get started working with Nick Chubb? We have always had a good relationship with Ron Courson, the senior associate athletic director for sports medicine for the University of Georgia football team. We started working with some of the UGA football players several years ago. Ron and I both found that our style of training could help them recover from injuries and be a big part of their rehab process. Nick Chubb is the most recent UGA football player we worked with. He had an extremely severe knee injury in October of last year. It was pretty gruesome. We started working with him in March, about 6 months after the initial injury. Is taekwondo a traditional method of rehabilitating sports injuries? I don’t think so. Ron has always found it helpful for players who were recovering from knee injuries. Usually, players will do physical therapy and drills on a track. Doing martial arts for therapy is not very common, but Ron understands what martial arts can do to help players regain strength and mobility in a variety of ways. How did Ron end up choosing your studio to help players recover from their injuries? Ron trained with us himself for a long time, I believe his rank is a red belt. His son and daughter trained with us as well. Ron is very busy, so he doesn’t come in as often anymore, but he experienced what it was like and knew that it could help his players. What condition was Nick Chubb in when he started working with you? Nick was not able to use his full strength when he first came to us. His range of motion was limited, and he wasn’t confident with his physical abilities at the time. It was impressive that he could start training again just 6 months or so after the injury. Many people with injuries like that don’t ever make it back to the game. An injury like that can be career ending. We worked with Nick two to three days a week for about 5 months. He trained with us from March until the end of August. So he made it back to playing within about 11 months. Did Nick follow a routine type of training or did you develop a special program for him? At first, we took a very monitored approach. Once we saw what his body was able to do, we were able to ramp up the drills. After a few months, he really started progressing. I think he started feeling more confident in the way his body was able to respond to the drills we would perform with him. The goal was not to train him to be a martial artist or learn how to fight. It was strictly to strengthen the area around that knee. We did a lot of kicking drills and a lot of reaction drills where he had to shift his weight on and off the knee. Even as the supporting leg, that knee would have to pivot, twist and absorb a lot of shock. We performed a lot of tension drills using resistance bands to work those different mechanics. A great deal of stretching was involved in getting his range of motion back. None of this was out of ordinary as far as martial arts goes, but the training really emphasized that knee. 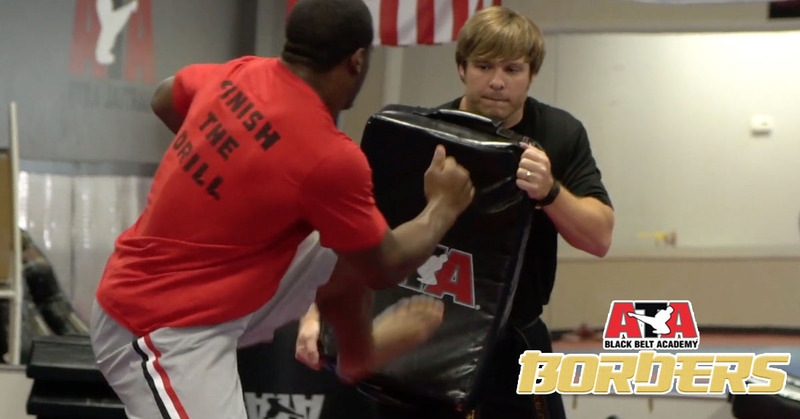 Georgia RB Nick Chubb as he reflects on his return to the playing field and working with Borders ATA Black Belt Academy. What kind of impact did working with Nick have on you? I don't think we realized the impact we were having on his rehabilitation until when we were notified that ESPN wanted to bring us in on the piece about his recovery. They wanted to highlight the main factors that were involved in his improvement. We took a lot of pride in the fact that we were able to help him so extensively. We knew from working with him that he was progressing and that our training was definitely working. However, we didn’t realize until people started contacting us for interviews that we had been such a major part in his rehabilitation process. Also, I want everyone to understand that taekwondo was just the avenue for Nick’s recovery. The biggest factor in his successful rehabilitation was Nick himself. I’ve been around many people, but Nick Chubb is one of the hardest workers that I've ever seen. Martial Arts training was a tool we made available to him to help his recovery, but the credit really goes to him. Coming back from an injury like this requires more mental strength than anything else. Nick’s will and desire to bounce back helped him do something most people couldn’t have done. Nick is the one who showed up and worked his tail off every time. Even when he began doing drills with the team again, he still came to train with us no matter how tired he was. I think it’s a real testament to the type of dedicated person that Nick is. We were just along for the ride. That's amazing. Do you think this type of non-traditional rehabilitation treatment is going to set a precedent for other athletes? I would like to think so. Sports medicine is constantly evolving, and being able to do more to aid in recovery can only be good. Maybe other martial arts instructors will be inspired to do something similar. Also, we hope that this story helps others become aware of the benefits of martial arts for their health. Perhaps it was the ability of the martial arts training to engage the knee in a variety of ways that helped Chubb regain his strength and mobility so quickly. Perhaps it was the mental requirements of taekwondo that meshed so well with Chubbs’ determination. Either way, Chubbs’ unique rehabilitation process and unyielding work ethic helped him start the 2016 season off strong.